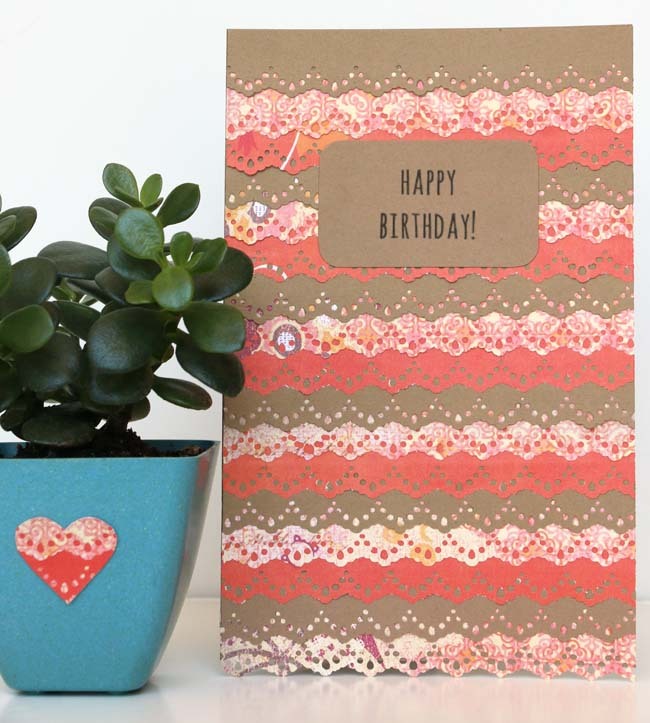 It's been awhile since I've worked on a project, so when my sister-in-law's birthday rolled around, it was the perfect opportunity to create a pretty and simple card. I used this technique a few years ago for the cover of my journal, and it's one of my favorite projects-- Simple with a little flair. Using a paper cutter, cut 18 1-inch thick strips of paper. 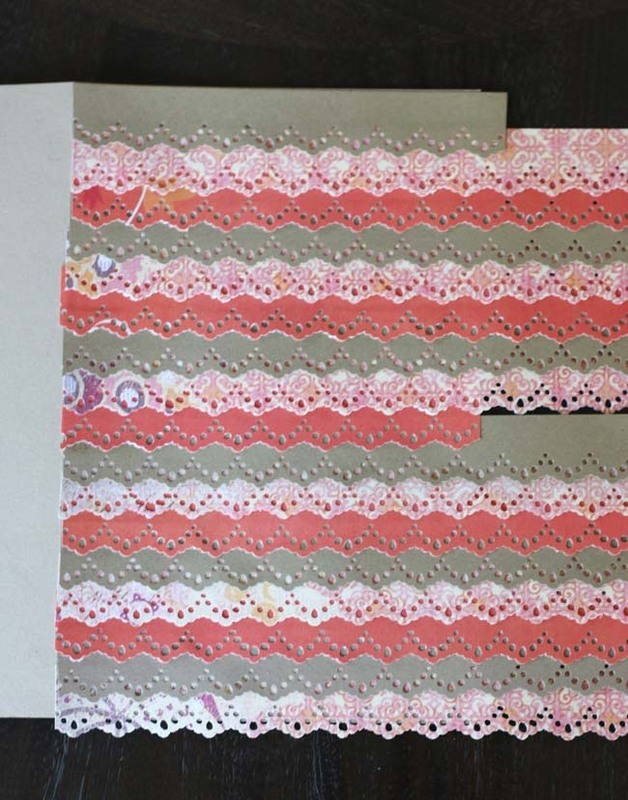 I used 3 different decorative papers so I cut 6 strips of each type of paper. 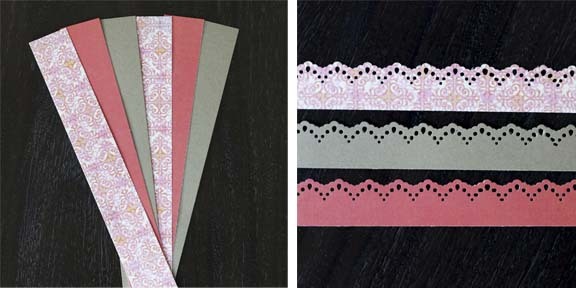 Punch one edge of each strip of paper using a scalloped edge punch. Determine the size of your card. I folded an 8.5"x11" piece of craft paper in half, so my card measures 4.25"x5.5". Using a scoring board, score the paper for a clean fold. Pour a little mod podge onto a paper plate. Using a foam brush, *lightly* sponge on mod podge to the back of the decorative strip, then attach the first decorative strip to the card base. Start at the bottom of the card. The decorative edge of the strip should face down. Leave any excess paper. Continue on to the next decorative strip. Stagger the scalloped edges so that curved edge lines up to the point of the strip below. 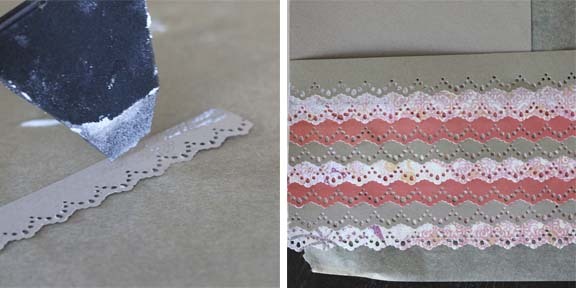 Again, lightly sponge on mod podge to the back of the decorative strip and leave any excess paper. 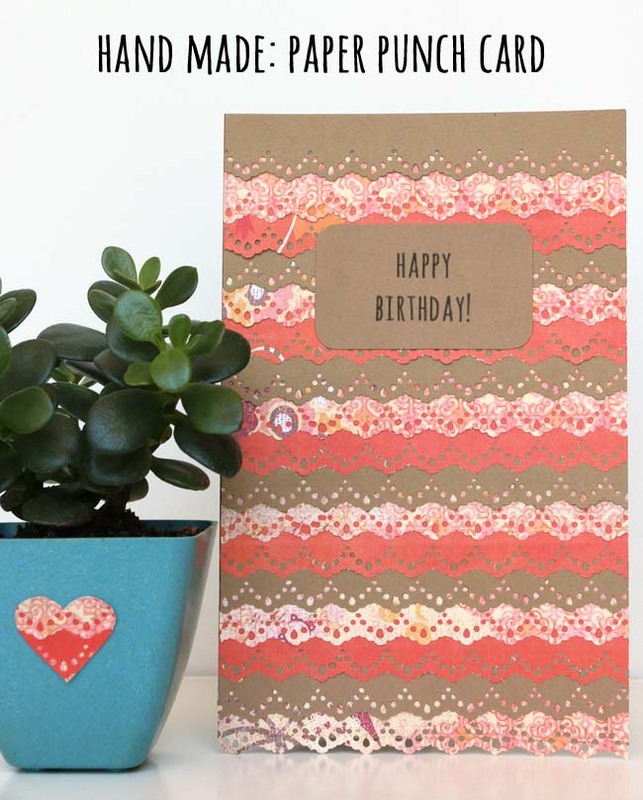 Continue attaching the decorative strips, staggering as you move up the card. Try to keep the spacing as even and straight as possible. To make this easier, I lined up the smallest holes. The paper of the previous strip should show through. When you're done, use a paper cutter to cleanly cut off the excess paper. Open the card up so that you can see the base of the card and use this as a guideline. 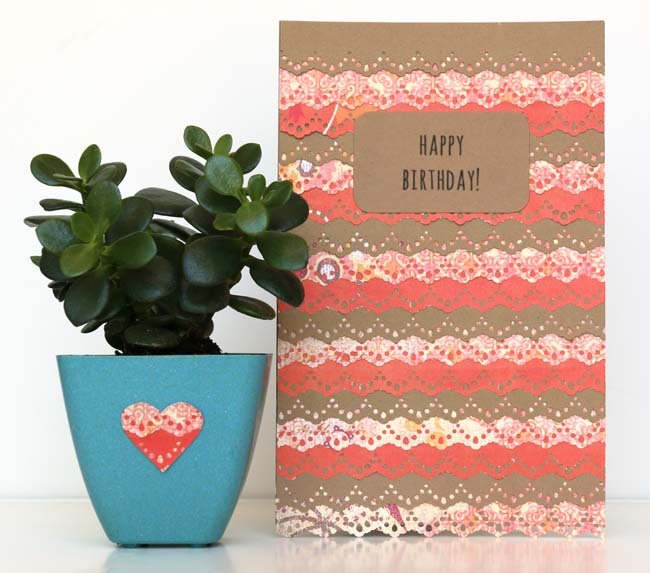 If necessary, trim any excess paper at the fold of the card. I did this with scissors. Lastly, add a placard to the card. You can stamp or hand letter… or use a computer/printer. I didn't have the right stamp and don't trust my hand-lettering skills, so I ran it through my printer and cut it out. 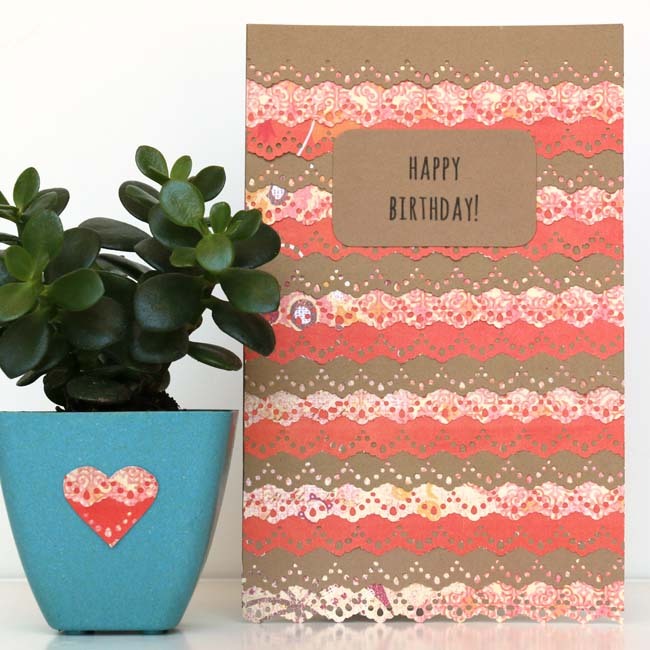 I finished the corners with a rounder corner punch and attached it to the card with a little tacky glue. With the scraps, I decided to make a couple of decorative hearts. 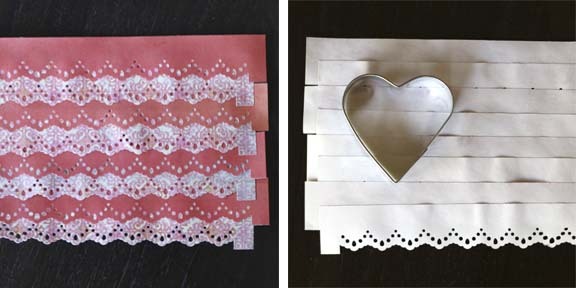 On a sheet of wax or parchment paper, layer the decorative strips of paper, set them with mod podge, then seal the top with a coat of mod podge. Let the mod podge dry. Then draw a heart on the back (I used some cookie cutters for the outline), and cut out the heart. 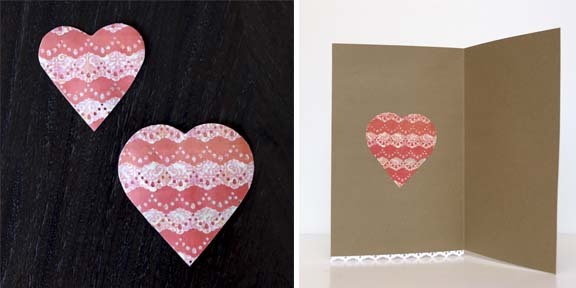 I added a heart to the inside of the card and one to the back as well. Attach with a little tacky glue and the card is finito!